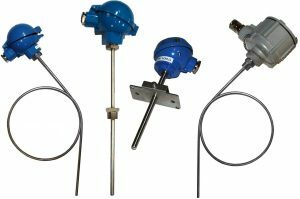 Liquid expansion thermostats, with bulb and capillary in copper or stainless steel, are designed to guarantee safety and control of heating or cooling systems. 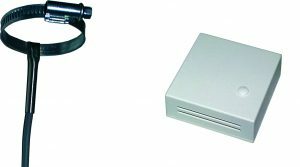 Comprising 1, 2 or 3 contacts, they can be supplied bare or in an IP30 to IP55 plastic or aluminium protective case. Maximum switching capacity: 20 A under 400 V 3-phase. Several temperature ranges that can be set by push button are available from -30°C minimum to 550°C maximum. Rod models with fixing screw, positive security models or equipped with 2 bulbs to provide both control and safety functions and preset threshold limiters make up the Vulcanic range. Electromechanical thermostats use metal expansion of the cartridge to operate a bimetallic strip. The set point (bimetallic voltage) can be set externally by a micrometric screw. Vulcanic electromechanical thermostats are designed to control the temperature of a solid by insertion into a cavity. They control the temperature of gases and liquids by insertion into a thermowell up to 315 °C, 20 bar. They are also currently used in the field of fire safety. The stainless steel 304 cartridge (diameter 1/2″ or 5/8″) can be equipped with an NPT threaded connector or a flange allowing simple assembly on the wall of a sleeve or enclosure. Vulcanic electromechanical thermostats, with NO or NC output contact, are offered with output by wires, with IP65 disconnectable connector, or in an IP65 aluminium or stainless steel protection box with 1 or 2 connector glands. Vulcanic manufactures temperature sensors based on platinum resistance technology Pt100 and thermocouples (K, J, S, etc.) as part of our standard range or as a customised solution. 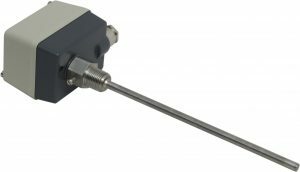 Temperature sensors are offered in various diameters (metric or gas pipe) and lengths, in different materials, (stainless steel, Inconel), in flexible or rigid sleeve, by cable output or with aluminium or stainless steel cover, and may be equipped with fixing devices (fixed or sliding threaded screw, flange, etc.). Optionally, measurement convertors (simple or double) for analogue signal output 4-20mA, are mounted in the sensor head. Some Vulcanic thermostats and temperature sensors are also ATEX-certified according to Directive 2014/34/EU, for installation in explosive atmosphere (risk areas 1 and 2), for a temperature class T5 and T6 with a protection mode “d” and “de” for thermostats, and “d” and “ia” for temperature sensors.